I'm not one to dismiss people's claims of criminality against people unless it is uncorroborated or unsubstantiated like Christine Blasey Ford's accusations against Justice Brett Kavanaugh. However, when it comes to unsubstantiated claims against former FBI Director Robert Mueller, there isn't just a claim, there is a criminal investigation against him by the Tennessee Bureau of Investigation for his involvement in framing a Navy veteran for a gun crime he never committed. For background on this story, click here, here and here. First, let me say this: Any and all federal and state gun laws are unconstitutional and unlawful. Why? Because "the right of the people to keep and bear arms shall not be infringed." The Second Amendment simply re-emphasizes that our rights come from our Creator and they are unalienable, which mean that we cannot give them up nor can we relinquish them. I've reiterated this more than any "conservative" outlet, even pointing to the fact that we have a right to tanks! Who on the "right" has stood by that? Only a few. With that said, special counsel Robert Mueller has clearly been engaged in framing a man on gun charges, standing by quietly as a special agent in charge of the matter perjured himself in order to arrest the man, a Navy veteran, on criminal gun charges and stand by while that veteran and other veterans were charged with crimes they simply did not commit while his FBI assumed what they thought, just like in George Orwell's 1984 . 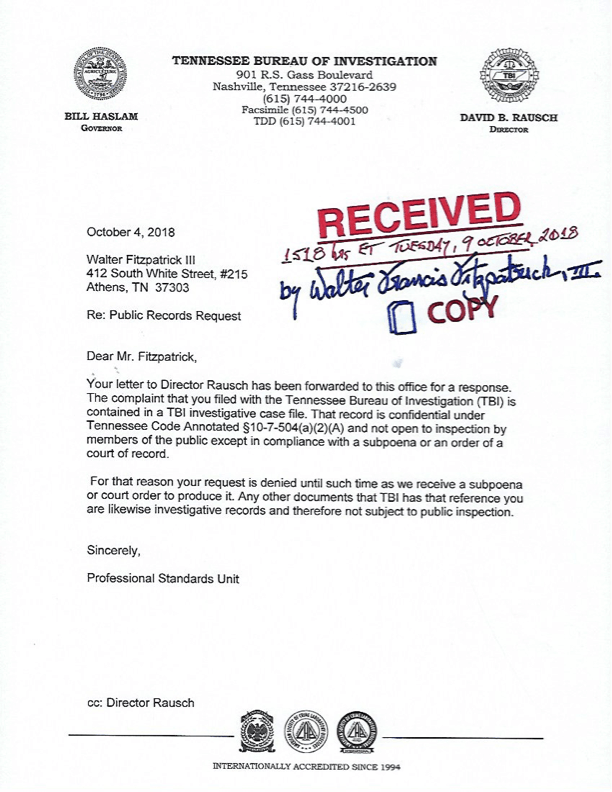 The information that there is an actual criminal complaint, not a political one, has been confirmed by the Tennessee Bureau of Investigation (TBI). A letter from TBI indicates that there is a criminal complaint against Mueller regarding his conduct in the case and that the matter is stored in an investigative case file at TBI. Why is the press now speaking or printing about this? Is it because they are following the narrative of the Marxists they work for both in business and government? I'm guessing so, but due to the internet, despite the censorship of Facebook, Twitter, Google, YouTube and others, this information will get out to people if you don't just like, but share.